The F-16I is a two-seat variant of the Block 52 developed for the Israeli Defense Force – Air Force (IDF/AF). Israel issued a requirement in September 1997 and selected the F-16 in preference to the F-15I in July 1999. An initial "Peace Marble V" contract was signed on 14 January 2000 with a follow on contract signed on 19 December 2001 for a total procurement of 102 aircraft. The F-16I, which is called Sufa (Storm) by the IDF/AF, first flew on 23 December 2003, and deliveries to the IDF/AF began on 19 February 2004. The F-16I has an estimated unit cost of approximately US$70 million (2006). One major deviation of the F-16I from the Block 52 is that approximately 50% of the avionics were replaced by Israeli-developed avionics, such as the Israeli Aerial Towed Decoy replacing the ALE-50 and autonomous aerial combat maneuvering instrumentation, which enables training exercises to be conducted without dependence on ground instrumentation. Elbit Systems produced the aircraft's helmet-mounted sight, head-up display (HUD), mission and presentation computers, and digital map display. Furthermore, the F-16I can employ Rafael's Python 5 infrared-guided air-to-air missile, and often uses Israel Aircraft Industries (IAI)'s removable conformal fuel tanks (CFT) for extended range. Key American-sourced systems include the F100-PW-229 turbofan engine, which offers commonality with the IDF/AF's F-15Is, and the APG-68(V)9 radar. Israeli F-16s have always been popular kit subjects with jet modelers. I can recall several years ago when Hasegawa boxed their 1/72 F-16D with resin bits to make Israel's then unique two seat F-16. It sold for a high price and sold out quickly. Since then, to my knowledge, there has not been one of these kits produced by a mainstream manufacturer. Back in 2010/2011, Kinetic produced two very similar kits; this one and one based on those aircraft operated by the Polish Air Force. 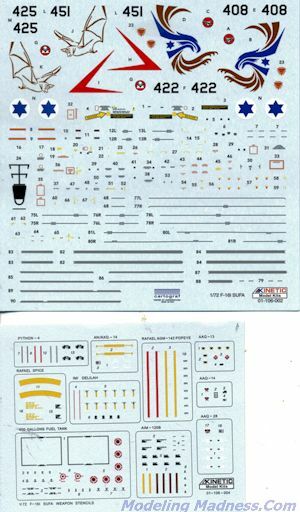 What you get here is a standard block 52 F-16 kit with several additional sprues to add on the bits to make an F-16I. Overall, the molding is good, though, like other Kinetic kits, the external detail is a bit larger than what you'd get on say, a Hasegawa kit. I found a small amount of flash on some parts. The upper fuselage has the wings molded in place with the holes already drilled in the lower wings. This is not an issue as most want to load up the model with ordnance. The cockpit has a full tub with lightly raised detail on the side consoles and the instrument panel sections. There is a control stick and throttle provided as well. The ejection seats are four pieces and molded without belts. Typical of other F-16 kits, the main gear well is several sections and separate. In this kit, there are tabs on the side of this construct with holes that fit over pegs on the lower fuselage section. The nose gear well is molded into the lower section of the intake and like other kits, this section has two side halves that enclose it capped with the front of the intake. This then sets into a hole in the bottom fuselage section. Main and nose gear are nicely detailed along with the wells. Exhaust is two pieces with the burner can including part of the rear fuselage. Again, pretty much like every 1/72 F-16 kit I have ever built. The new bits are molded in a different color plastic and seem to me to be a bit softer in detail from the rest of the kit. The large bulges for the forward formation lights are the only parts I saw with sink areas on them. You would expect a lot of add on bits and you would be correct. There are a myriad of scoops, antennas and other lumps and bumps to add to the airframe. The upper fuselage spine section is in two parts and there is an insert to be placed into it. Other items to add are the conformal fuel tanks and the canopy section, which can be posed open or closed. I did not see a seam in the canopy which tells me that it is not a proper 'bubble' but has straight sides. The kit comes with a sprue dedicated to weapons that would be the norm for the Israeli version. This includes AMRAAMS, Python missiles as well as some other rather interesting looking guided bombs and sensor pod. 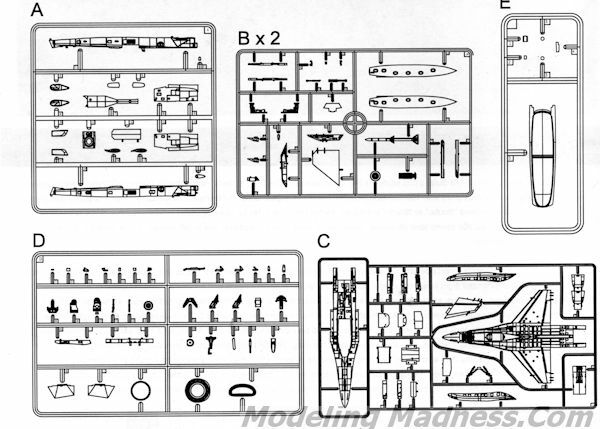 Interestingly, the weapons sprue is not shown on the sprue image at the beginning of the kit instructions. Instructions are nicely printed and offer both generic and Gunze paint references. Markings are provided for two aircraft both painted in the most recent scheme of FS 33531 Sand, 34424 Green and 30219 brown over 36375 grey. Markings are for the box art plane of the Negev Squadron (two number options) and for the Bat Squadron (two number options). The decals are nicely printed and include a full data suite as well as complete weapons markings. There are aftermarket for this variant if one is interested in using those. It looks like it will make into a nice model. I have heard that there are shape issues with the kit, but from my un-trained eye, things look just fine. It is a ready to go kit for those who want to model some of the more recent F-16s as it has all the proper bits for those flown by several other nations. 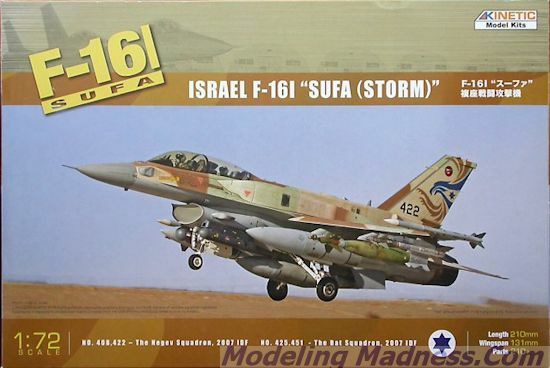 For those really into the F-16, it is a kit you should seriously consider. Thanks to www.hlj.com for the preview kit. You can find this kit at this link.